A blog for absolutely Popping Poptropicans! Another revival of a weekly specials segment. Guess what it is! It’s in the title. This week is a continuation of the most recent one we did, Harry Potter Pt.1. Let’s get right into it! Lips: Is costumizable from any Poptropican and is also quite common. Check your friends’ closets! Dress: Also found in New You, keep switching the outfits till you find it! Sword: (an alternate wand) Can be found in the Store, the Amazonian Woman card, which costs 0 credits. Hair: Can be found on the Gamer Girl card in the store, which costs 0 credits. Smile: Found on any Poptropican! Any smile works too. Scarf: Can be found on any Poptropican, or in the closet of rainbow2426. Shirt and skirt: Also can be found on any Poptropican. The shirt can be found in the closet of slantedfish. For easier access to this whole costume (except the hair) simply friend chochangpop10 and costumize. Hair: Keep switching the dummies on New You and get this hair. Frown: Any frown works! Just make sure it’s the most displeased one you find. Robes: Not sure where to find them, but they can be costumized from severussnapepop10. Again, to make things easier, simply friend severussnapepop10 and costumize the whole costume. Alright, that’s it for our Harry Potter costume line! Comment requests for future costume lines, and opinions on this one, down below! We appreciate feedback 🙂 We hope you enjoyed this line and perhaps you guys can use these costumes some day! Check out Harry Potter Pt. 1 here! Check out our previous Fashion Friday weeks here! And I promise, our blog is gonna really be active again, starting from this post. Anyway, for this week, it’s one of my main fandoms, Harry Potter characters based on their attires in the movies 🙂 Since there were many costumes this week, mostly by Friendly Foot, we’re going to have 2 separate posts 😀 First post is the trio, second are other cool characters. Hair: This hair, which is shaded better than the average Poptropican hair, is from Jack on Red Dragon Island, but is also costumizable from anyone you see in common rooms. Glasses: Can be found on the girl next to the Photo Booth on Home island. Shirt, Pants and Scarf: All are costumizable from other people, and the scarf is pretty popular among community poptropicans. For easier access to everything, just friend harrypotterpop10 (Happy Moon, Friendly’s account). Everything is costumizable. Hair: From ASG: *cloud*10 (if you don’t know how to perform an ASG, check this out! Clothes: The jacket can be found on Spotted Dragon, just add her at ooolala13. The shirt, belt and pants(and jacket too) can be costumized from that costume in my closet. Add me at maryamkamal2197. Remember to change her hair to something similar to that shade! Head: Hair and freckles are both from New You, inside the shop on Home Island. Jacket and pants: From the girl next to the Photo Booth on Home Island. Anyway, that’s it for this week’s line of costumes. Stay tuned for Harry Potter Costumes Part 2! Hello everyone! Lucky Joker here– bringing you more costumes for you to try! Most of us will be going to school soon, and some of you have already started! With that said, this week’s Fashion Friday theme is Back to School. The POP team and I have created costumes, representing high school stereotypes. Please don’t take this into offense, as we were just having good fun. Head: This fabulous hairdo is costumizable from Flashy Florian Fosbury from Escape from Pelican Rock Island. You’ll have to get through some of the island to do so. You can find a full walkthrough on the PHB. The bangs, however, are from the Spy lady in B.A.D. Bistro, on Spy Island. Face: The lips can be ASGed off of “iPop#5”. Body: The jacket can be found from the ASG “gpopsinger101”, if you don’t have the store card for it. For the top, use the ASG “scheherazadetoldathousandtales”. For the skirt, costumize off of the cheerleader costume in the store. Hand: The lipstick can also ASGed from “iPop#5”. Head: The hair can be found on the hotel manager, on Reality TV Island. Face: The glasses can be costumized from Zany Panda. Her UN: unitatogirl. Body: The shirt can also be found on the hotel manager on Reality TV Island. The bow tie can be found on the “April Fool’s Day” Store card. 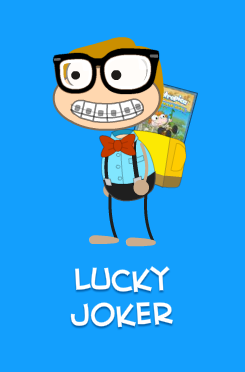 The backpack can be found off of the Poptropica: The Official Guide card. Head: The hair can be be found in New You, on Home Island. 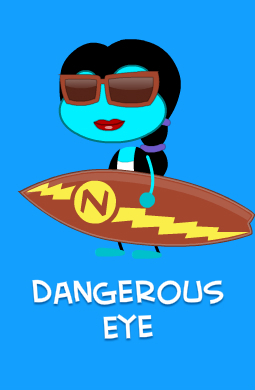 Face: The cool shades can be obtained from “Mythology Surfer”. The lipstick can be ASGed from “iPop#5”. Body: The shirt can also be found in New You. As well as the black pants. Hand: The surfboard can be found from the Mythology Surer, in the store. Head: The hair can be seen on the Vampire Girl 2 Store Card. The bangs with earrings can be be obtained from the Pop Star store card. Face: The blush comes with the earrings, and as for the lips– You can find them on the angel costume. Body: The top can be found on the Mythology Surfer (Purple). The skirt can be fond from the Gothic cheerleader costume. Head: The hair and headphones can be seen in the New You. Face: The sunglasses can be costumized from the Gamer store card. Any frown works. The one shown in the picture is from the Wild West Big headed boy. Body: The shirt, hoodie and jacket are all from Gamer Guy on Zomberry Island. You may need to do some of the Island. However, I’m not completely sure. The fanny pack can be costumized off of the explorer on Home Island. The black pants can be found off of any random Poptropican. Hand: The flashlight can be found on Zomberry Island. Head: The pony tail can be found on the girl standing near the “Ye Old Poptropica Store” on Astro Knights island. The bangs can be found on the Rockstar 2 store card. Face: The dark bags under the eye are on the “Gothic cheerleader”- The store card. Any frown works for this look. Body: The top can be found in New You, and the pants can be found on “Vampire Girl 2”. Well, that’s it for now! I hope you liked the costumes, and try them out. Have fun, and good luck at school everyone! POP on! *Before we start, let’s wish a very Happy Birthday to POP author, Dangerous Eye! Hello, everyone! I’m Lucky Joker bringing you the fifth line of costumes for Fashion Friday and the nostalgia is real. This week’s costumes are all inspired off of one of my favorite childhood shows and franchises to date, Scooby Doo! Daphne Blake (White Ice): Most of this outfit can be found by randomizing the dummies in the “New You” shop on Home Island. The green handkerchief is on a boy waiting in line on Poptropicon Island, episode 1. Mystery Incorporated at it’s finest! Scooby Doo:*takes mic* Ranks for runing in! See you next reek rith rore rostumes! Rop on! Translation: Thanks for tuning in! See you next week with more costumes!POP on! Hello everyone! It’s Lucky Joker presenting you with the Fashion Friday’s fourth line of costumes we’ve created for you to try! Yup! Marvel PT 2! We created these inspired looks based off of a few more characters from the Marvel franchise! Let’s POP into it! Head: You can get this hair from “Mythology Surfer”, currently in the store. Face: The mouth can be found on the boy standing in line, on Main Street, on Poptropicon Line Forms here. -and costumize from the dummy. You can get the purple pants from the “Prom King”. Head: The bangs are on Black Widow, and the locks are from “Vampire Girl 2”. Face: The lips can be obtained from the ASG: iPop#5. Keep in mind, this is the first step you’ll want to take. To achieve Wanda, costumize the ASG, off, afterwards. Body: The dress is on the spy lady on Spy Island. If you’ve completed the island, it can be found in “Headquarters”. If you haven’t, the dress can be seen in “B.A.D. Bistro”on Balding Avenue. Face: The frown can be found the same place as the hair. Body: The shirt can also be found in The Statue room in the Art Museum, after completing Counterfeit Island. That’s it with Marvel for now. Who knows? Maybe we’ll do another one in the future. Thanks for stopping by, and hopefully you give these costumes a try! POP on! Hey everyone! Welcome to the second line of costumes of Fashion Friday! I’m Lucky Joker, and let’s get into it! Half of the team and I have gathered various items throughout Poptropica to create these inspired looks based off a few DC Heroes and villains! Head: A bald head is easy to obtain on Poptropica. No need to reveal your concealed baldness, after organising a secret organisation, stealing the hair of innocent Poptropicans and threatening to ravish all of the hair of Poptropica. All you have to do is go to Cryptids Island and costumize as the guy standing in front of the General Store holding the soccer ball. Face: ASG the mechanic face with- BinaryBard97 ASGing the mechanic face will be the first thing you want to do, then costumize the Binary Bard costume away. Any frown works for this. Body: The shoulder wear and “shirt” can be obtained from the Game Show Robot in the store. The pants can be found on the Midnight Red Ninja in the store for a limited time only! Head: The bangs are on the Vampire Girl 3 costume and the locks are on the Vampire Girl 1 costume. Face: The luscious lip gloss is on the Prom Queen outfit available in the store. Body: The leather jacket can be obtained from the Biker Girl outfit in the store. The Black pants can be added from anywhere. And the top can be found on the Vampire Countess costume. *Colourizing is optional, but highly recommended in order to achieve the look! Head: The bands are on the Prom Queen costume, and the hair is found on the Vampire Costume 1. Face: The blush is found on the Cheerleader outfit, and the lipstick can be found on the female Zaggy Moondust outfit. Neck: The red cape is available in “Masks and Capes” on Super Power Island. Body: The shirt can be costumized from any given Poptropican on say, Early Poptropica Island. Reload and reload your screen to find it. The skirt is also found on the Cheerleader outfit. Head: (Not shown in the picture) Costumize as the man in front of the General Store, on Cryptids Island, as we did before. Face: This is from the scarecrow in the store. Body: You can costumize this suit from Harold Mews, the billionaire inhabiting the mansion, on Cryptids Island. You will have to complete just a tidbit of the island to do so, but not much. A full written walkthrough with pictures can be found on the PHB! Head: This is obtained, when you buy the “Cheerleader” in the store. Face: You’re going to need to colourize your skin to be white. Get the eye makeup from “Vampire Girl 1”. The lips are worn by one of our authors, Zany Panda. Her username is UnitatoGirl, so feel free to add her! Neck: For this, we’re just going to ignore the fact that Poptropicans don’t have necks. You can acquire this awesome choker by adding Zany Panda on Poptropica. You can also get this from Sickly Skull on Reality TV Island if you want to. Body: This defiant top can be costumized from the Devil Girl costume. The purple skirt can be found in the “New You”. The belt can also be found on Zany Panda. Hand: The bat is from the Baseball Batter currently available in the store. I hope you all like these costumes and decide to give them a try! Which one is your favourite? Let me know in the comments! This is Lucky Joker saying, POP on! Hi everyone! I’m Lucky Joker bringing you the first Fashion Friday line of costumes! A cluster of the POP team and I have all developed these incredible looks you need to try! I hope you like them! This outfit is inspired by the wildlife loving, Rachel, from the Percy Jackson series. Hair: Nothing Special. Find this in “New You” on Home Island or Costumize in a common room or friend’s list. Outfit: The outfit consists of the Psychedelic T-Shirt from the store, and the pants are costumizable from pretty much anywhere. Paint Brush: This item is from Slanted Fish’s closet. Add her. You guessed it! Her username is Slantedfish! Hair: This is the head item from the Fall Fashion Outfit, which you can get from the store. Face: The glasses are found on the woman in the Queequegg’s Coffeehouse on Back Lot Island. Any smile works for this! I got mine from “New You” on Hub Island. Outfit: You can find the mime shirt and suspenders in Downtown Counterfeit Island. The pants are costumizable from anywhere. The satchel can be costumized from anywhere. However, this is pretty hard to come by. Hand: Little Candy Cane- This can be found in the store. This look is inspired by Percy Jackson himself, now modified to fit the female Poptropican. Hair: Obtain this by purchasing Rockstar 2 from the store. This attire is an original and very creative. This is how you can replicate it! Hair: You can find this in the store a part of the Fairy Queen costume. Outfit: Shirt- Get this from the Icarus Costume. If you’re not a member, you can ASG it. (icarusasg#1) Pants- Can be obtained from anywhere on Poptropica. Well, that concludes our very first line of costume ideas! Stay tuned for more next week! POP on! The POP Blog team aims to keep you updated on Poptropica and its community, and also bring to you a lot of fun and interesting creative works by the team!